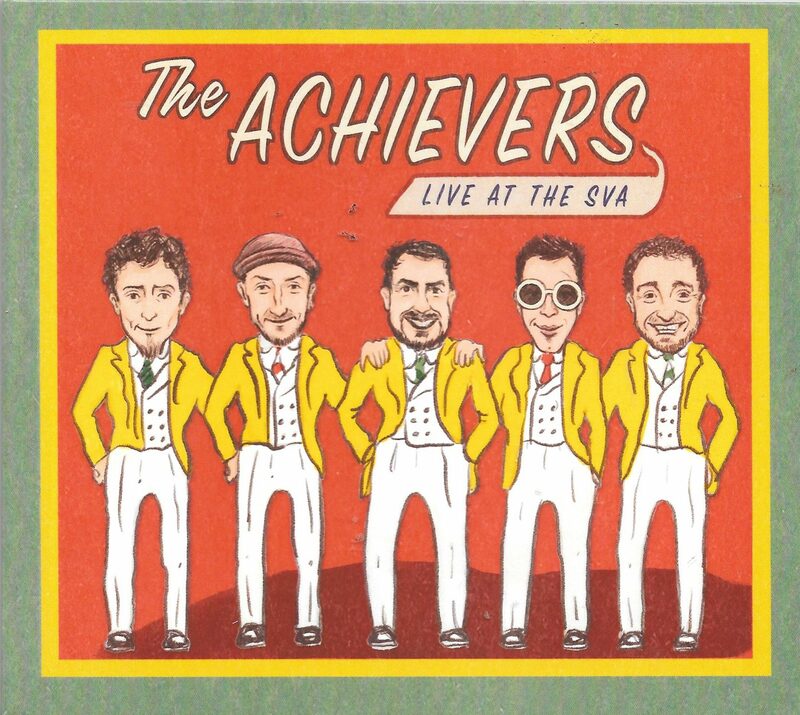 The Achievers’ Steve Ferbrache began his musical journey by busking around New York, Boston and Philadelphia and then spent time immersed in the London Blues & Roots scene (where he opened for James Hunter, Seasick Steve and others). In 2013, chance meetings, in an open mic night in a pub, with drummer Aron Attwood and Harmonica player Rufus Fry led to the formation of the band. Now based in Gloucestershire, they were quoted as saying that “having discovered the magic that can be created ‘in the moment’ we will only ever play together live”. That is now slightly redundant as, happily, they have just released their debut album called Live at the SVA; a somewhat misleading title as it refers to a truly live, but in the studio recording, rather than in concert. The entire album was tracked live in one day with only minimal overdubs so that their on-stage energy, freedom and cohesion can be appreciated. Unless I am mistaken, my knowledge of Gloucestershire, makes me think the SVA refers to the Stroud Valleys Artspace. This is an arts-centric facility operated as a charity and has performance spaces and artist studios, as well as a café etc. Although influenced mainly by 50s and 60s American Rhythm and Blues and Gospel vocal groups such as The Dixie Hummingbirds there is still a distinctly British feel to their output due to their ability to also inject a little soul into their boogie-woogie approach. In fact, their music will take you back to the early 60s when dance halls across the UK reverberated to real Rhythm and Blues and, should you be of a vintage to remember these days, then you will revel in the way The Achievers bring that sound to life. If you are not of that vintage, then be prepared to appreciate and understand why this style of music was and is so popular. If that doesn’t paint a picture, think early rock ‘n’ roll with a lot of swing in the mix. So ladies, get those petticoats out and gents, squeeze into those jeans and let’s rock ‘n’ roll! The first track (credited to Leon Brown, who was also known as Chu Berry, a leading saxophonist in the 1930s jazz/swing movement) opens with the vocal backed by gentle guitar before the beat comes in and straightaway the foot starts tapping. This is a relatively slow-paced song, with some nice harmonica colouring the carefully phrased instrumentals. A nice guitar and harp solo expand it further. Movement has a rapid strummed start and it’s easy to imagine the dance floor filling to this. A bit reminiscent of Bill Hayley in the way it bounces, although with the harp again to the fore, it is all Achievers. In Your Bed has a lovely, complex guitar intro and it is the guitar ‘voice’ which makes this one of the best mid-paced tracks on offer. Shelter again has an almost a capella opening with Fry’s warm tones working well. We’re soon into the swing with neat snare illuminating the backbeat. Lovin’ Machine comes from the often humorous and ribald pen of Wynonie Harris. He had numerous hits in the 40s and is considered by some as one of the founders of rock ‘n’ roll. The Achievers take it into this century without losing the bite of the original. Typical of its time in the structure, but made their own through more subtle harp work and a solo of such empathy. Voodoo Workin’ by Charles Sheffield, a 60s R&B singer who was also known as Mad Dog Sheffield, didn’t have a lot of success, but this song is his biggest legacy. A slower pace for a melody steeped in tradition. The Cuckoo has its roots in a 16th century English folk song, but has travelled the world and appeared many times and in many guises, from Appalachian folk to out and out blues (Taj Mahal covered it in 1969). Here it gets a really creative and sympathetic interpretation. The guitar is a revelation as it sweeps up the old country feel and turns it into a rock ‘n’ roll master class, with a great harmonic guitar solo to cap it all. Como Blues has a real blues intro with guitar and harp. Lyrically and in its structure, it takes on all of the blues tropes, but still feels fresh. My favourite. Run On is another “traditional” song arranged by the band. This one’s origins are shrouded in the mists of time, although Odetta and Johnny Cash did record versions of it called ‘God’s Gonna Cut You Down’. Here it has an electrified and speeded up field music feel, which benefits the song, especially in this bands’ context. The album wraps up with Come Along, which sounds as if it was written as the last song of their set: a chance to swing out in style. In summary, then, this type of music is far from my normal fare and yet I couldn’t help being pulled into the atmosphere the band build with such ease. I doubt I’ll play all of it that often, although The Cuckoo and Como Blues will feature regularly in my playlists. If, however, you love the era they evoke so well and you fancy a nostalgic trip to the dance halls of yore, I doubt you could do better than The Achievers.